Post blog note, July 2017: writing about the building led to a campaign to stop its major and unsympathetic alteration, which can all be read here if you’re v. bored (or a PhD researcher) – first, second, third, fourth, fifth, sixth, seventh, eighth and finally, success! Post blog note, March 2010: I sound quite negative in the post below, which I wrote a couple of years ago, when I was just beginning to explore some of the buildings of the 1980s Berlin IBA. 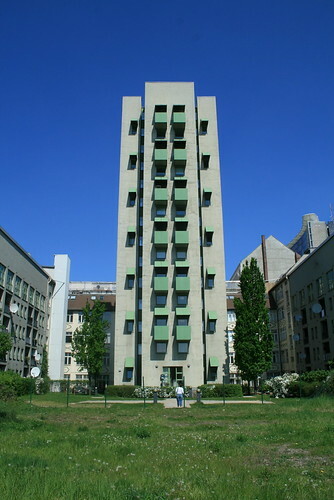 Since then, I’ve come to know a lot more about John Hejduk’s work and this building in particular, including getting to know some of the former residents. I’m not into rewrites – not really in the ‘diary’ spirit of blogging, but worth mentioning it here as it may otherwise seem a strange (and rather uninformed!) commentary from someone currently campaigning to have alteration to the building stopped. 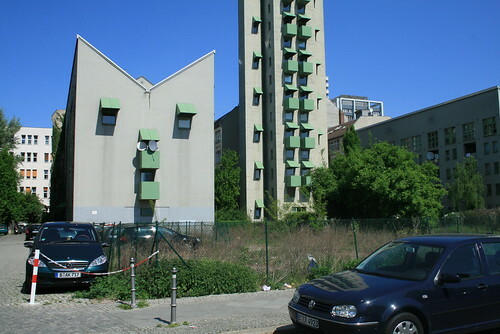 Some images of John Hejduk‘s contribution to the Berlin IBA 87, a project perhaps less successful ‘on the ground’ than some of the other IBA 1987 projects I’ve visited/blogged about, at least in terms of its relationship with its surroundings. The design actually comprises three separate buildings, of which one is the central tower, the two others forming wings to a pre-exisiting building to the rear. All three are residential. 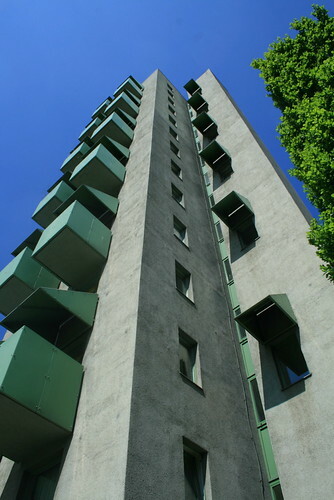 As with many IBA projects, I wonder whether the design of the actual apartments, in particular the sizing and positioning of windows, played second fiddle to architectural formalist facade games. I assume Hejduk didn’t reckon on the visual impact of satellite dishes, a de rigeur feature of social housing. But anyway, I’m no expert on his work, so can only respond as I find here. If there’s a real problem, it’s the site immediately to the south; there are street entrances to the two wings, but the tower and enclosed communal space can only be approached across a piece of waste ground. The garden area enclosed within the site looks pretty uncared for, and the empty plot in front just gives the impression of a forgotten place going to seed. Such space is a unique aspect of Berlin among western capitals; even here, so close to the core of the city, are odd pockets of waste ground, some covering entire blocks. They are only slowly filling up, and for better or worse Berlin will be a different place when they’re all gone. And that waste ground: not much of a view for the residents. I was under the impression that the rooms in the tower were artists’ studios. Not sure if they’re used as such (apparently not, given the presence of the dishes). This building is one of my favourite IBA buildings. Glad I found this site btw. Keep up the good work! does any body know if there are any plans for this project? buy the Vladivostok book, and some, some, plans are in there. 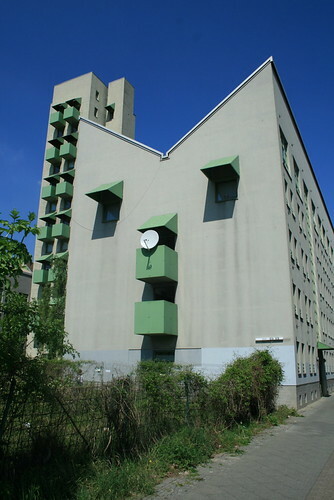 Does anyone know which buildings John Hejduk did in Steglitz-Zehlendorf in Berlin? There are supposed to be two houses of his.